Wow, July already, Happy Independence day to any American readers, I hope that movie was wrong about alien invasions. July 2017, wow! Why am I so excited you ask? 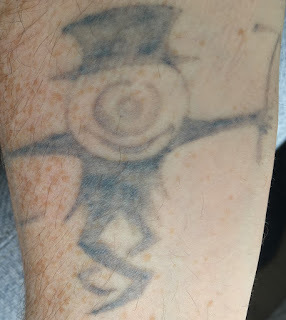 Well anyone who has been following me since I started this blog (note: there are none) will know that when I started the removal process in January 2016, I was pretty confident that the tattoo would be nearly, if not completely, gone by July 2016 for my family holiday. Yes, 6 months and 4 to 6 laser sessions was all I expected it to take. It turns out it takes longer than that, quite a bit longer than that in fact. I'm still pretty happy with the progress, I still have two prepaid sessions. In all honesty, I think it will take longer than two more sessions. The good / bad news is life is working against me getting shot in the near future. I'm due to go in August (3 month later) but I don't think I'll be able to. Then with various things going on, I think I'll be lucky if I can get there for October. I'm actually quite excited to see what difference that time will make to the fading. That was taken two days ago, unfortunately in bad light. The weird looking lines are because I had just pulled up my sleeve for the photo. Yes, we need sleeves in Ireland in July. I am quite happy with how the fading is going. The darker bits of ink are starting to break up, there is a LOT more skin colour coming through and I can see more of my freckles underneath. I'm also about as tanned as my pasty Irish skin gets, I genuinely think tanning speeds up the fading process, though that's pure speculation. I thought I saw more progress last summer and I think I'm seeing similar again. Though I might be talking pure nonsense. If anyone has any science around this, please science me. Me like science good. I'm weirdly excited at the prospect of having to wait a while for my next session. I've read that at this stage, 3 months should be the minimum wait period between sessions. This is because it is such a large trauma to the skin. The body has to heal then it begins removing the ink. Healing will take less time than that but more healing = better removal. I think 4 months is the longest I've gone (if even) but I think it could end up being 5 before the next. I might even drag that out if I see good progress. You definitely start to see progress in the weeks after each session but more weeks means more progress. I'm actually curious now if I stopped altogether would it vanish, just over a longer period. I recently met a friend who is also having a tattoo removed, hers was also black ink and between her shoulder blades on her back. I won't lie, I had total fade envy. I think she has had 2 q-switched and 6 Picosure, that's the same total number as me but more Picosure. I could really see the difference. One big advantage for her is the location; the closer to the heart, the faster it fades. Also I'm sure that more Picosure has helped too. I think she said it was 2 months since her last session but she wants to get another soon. I tried to persuade her to wait but her mind was made up. Everything I have read says it's all about patience. If you're considering removal, you will have to be patient, it's definitely going to take more than 6 months and 4 to 6 laser sessions.